Abhinam Yoga Center organizes Yoga Alliance US and UK certified 200, 300 and 500 hour teacher training courses. We aim to teach the subject of yoga as a whole by not only focusing on asanas but also including philosophy, meditation, anatomy, physiology, mantra chanting and teaching methodology. Abhinam Yoga Center has been started with the approach that a good teacher is one who is capable of being a good student. Yoga is a lifelong learning process; it is a life-style and demands a very humble, open and innocent mind. The word yoga has become synonymous with physical exercise in the west and it has adopted gym culture. Yoga has turned into a “do and die” culture. Abhinam Yoga School differs with the current fashionable and popular presentation of yoga. We are committed to bring back the true essence of yoga which is reflected in Yoga Sutra of Patanjali and other yoga scriptures. Our aim is to make yoga teachers aware of the eight limbs of Ashtanga yoga and practice without any injury.Abhinam Yoga Center also organizes yoga holiday packages, workshops for beginners and retreats. Our highly qualified team has years of experience and aim to teach in a very supportive, open and safe environment. Love this? Explore the entire list of places to visit in Panaji before you plan your trip. Fancy a good night's sleep after a tiring day? Check out where to stay in Panaji and book an accommodation of your choice. How popular is Abhinam Yoga Center? 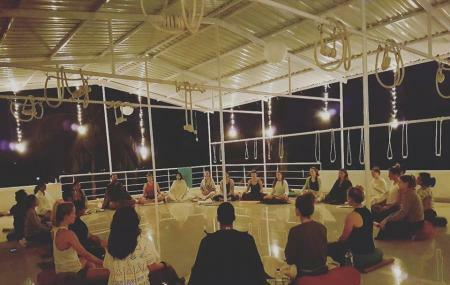 People normally club together Swan Yoga Retreat and Paliem Lake while planning their visit to Abhinam Yoga Center. The Training Program was very interesting and educational. I feel the course has helped me gain a new perspective and a more well-rounded understanding about yogic living. Thank you again for such a wonderful learning experience.